(Newser) – An attorney handling Johnny Manziel's domestic violence case expressed doubts about the Heisman Trophy-winning quarterback's ability to stay clean and said he was given a receipt that shows Manziel may have spent more than $1,000 at a drug paraphernalia store just 15 hours after he was involved in a hit-and-run crash on Monday, according to a lengthy text message accidentally sent to the AP. 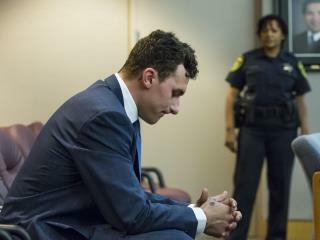 Defense attorney Bob Hinton's text indicated Manziel's legal team was seeking a plea deal with prosecutors, but suggested that could be tricky. "Heaven help us if one of the conditions is to pee in a bottle," the attorney wrote. $1,000 in a head shop? He must have cleaned out the entire inventory.